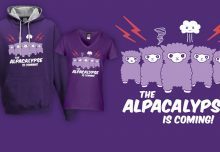 Three brand new t-shirt designs are now available to order online, after their debut at MCM London Comic Con. It’s really exciting to add some bright and colourful new designs to the range, including our first ladies’ vest for the summer! 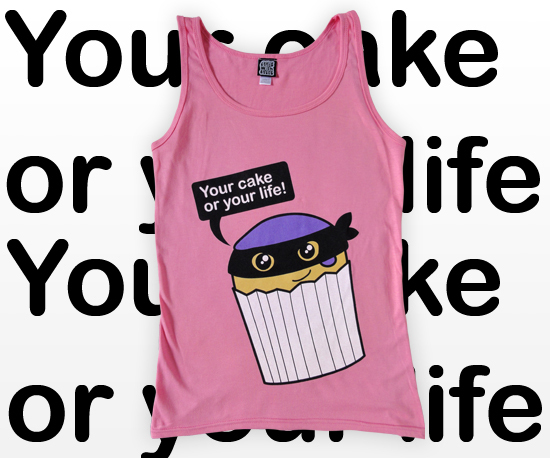 Your Cake or Your Life! This was originally a drawing I did when I was playing around with new assets for my app Cake Mix. 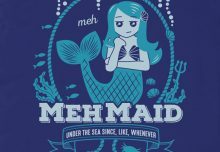 It was a popular drawing, so I’ve made it into a t-shirt design! It really makes a statement with a large cupcake print, printed lower on the t-shirt than usual, to make it a bit different. It’s printed on lightweight charcoal grey t-shirts, in ladies skinny fit and standard/mens sizes – in the online shop here. Lots of people I’ve met at events have asked if any of my designs are available on vests, so this design is the first to also be printed on a pink ladies’ vest – order online here. All are available in sizes small to XL, and the mens t-shirt goes up to 2XL. 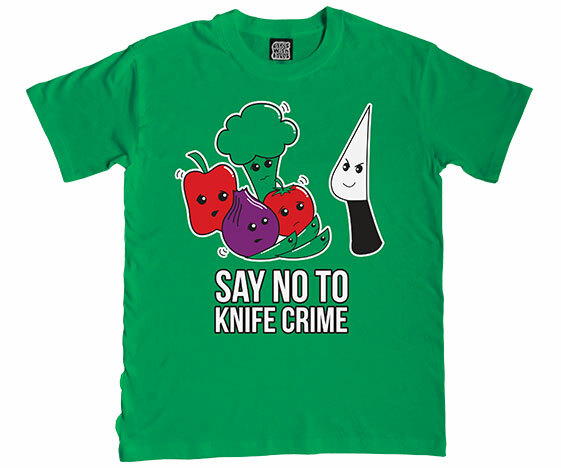 It was a close call, but this was the joint most popular design at MCM London Comic Con, along with Say No to Knife Crime (below). 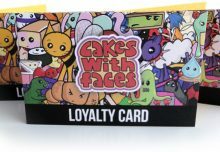 Anyone familiar with Cakes with Faces will know that I love toast, not just for breakfast but any time of day. 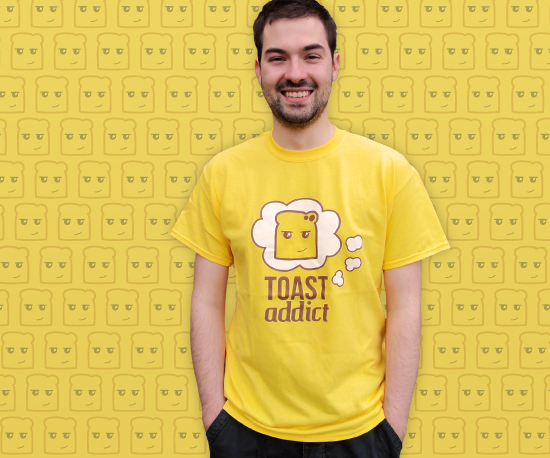 My new toast addict t-shirt’s printed on a hot buttery yellow shirt, with toasty brown outlines instead of the usual black, for a retro style colour scheme. I wanted to add a bright yellow t-shirt to the range, because it’s more unusual and is such a bright and cheerful colour. Toast addict’s already developing a cult following – someone at our last event bought the t-shirt, a toast badge and a toast charm – it’s good to know I’m not the only toast addict out there! The t-shirt’s available now in the online shop in ladies slim fit sizes S-XL and standard/mens sizes S-2XL. 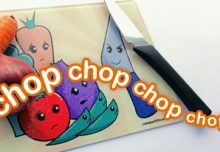 The final new design takes a more serious note and addresses the sober issue of knife crime in the kitchen! You might recognise the terrified vegetables from the chopping board design – now you can wear them and help raise awareness of vegetable welfare. We’ve gone all out with a colourful screenprinted design on a bright green t-shirt – a great present for vegetarians and vegans! It’s available to order online now, in ladies slim fit sizes S-XL and standard/mens sizes S-2XL.